As part of a partnership between the legendary Santa Cruz Skateboards and the equally legendary brewer, Pabst Blue Ribbon, comes the PBR Pintail Cruzer Skateboard from Santa Cruz Skateboards and PBR. This PBR Pintail Cruzer skateboard has the shape of a classic surfboard that harkens back to the days when skateboarding was considered to be the land version of surfing rather than something completely different that it has grown and developed into. The first thing you will notice about the Santa Cruz PBR Pintail Cruzer Skateboard is how long it is. Coming in at 43.5 inches long, this is a serious longboard. Of course, the other thing that will grab your attention is the classic PBR logo that adorns the PBR Pintail Cruzer Skateboard. The bottom of the deck has an enlarged version of the classic blue ribbon that has been cut in a way to make it look like the PBR Pintail Cruzer Skateboard was cut right out of a giant sign. On top, the logo is also there, though smaller so the entire logo fits the board and helps to give the top a minimalist look that the oversized graphic on the bottom doesn’t have. It might seem strange to have a graphic take up the entire top of a skateboard, and it looks like there is no grip tape, but that is not the case. Santa Cruz Skateboards has put a type of invisible grip tape on the top, similar to a clear coat with some sand in it that functions just as well as grip tape. Of course, you can’t have a skateboard that is based after PBR without having it somehow tie into the crisp refreshing beer that is Pabst Blue Ribbon. This is why Santa Cruz Skateboards saw fit to include a bottle opener built directly into the board. This is a brilliant feature that Santa Cruz Skateboards has been featuring in many different versions of their longboards, but this is the one where it makes the most sense and is the most appropriate, even if it is much more common to see PBR sold in cans instead of bottles, it is the thought that counts, and this feature is very thoughtful indeed. The biggest downside to the Santa Cruz PBR Pintail Cruzer Skateboard, like many complete decks sold like this one are the wheels. They aren’t bad wheels, by any means, but they are very soft, so they won’t hold up that well to a lot of carving. The bearings are also a letdown as well, and you should consider upgrading not only your wheels but also your bearings right away. 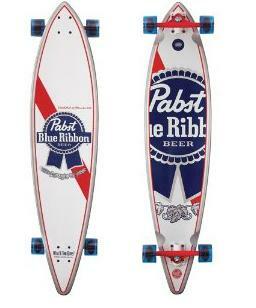 The Santa Cruz Skateboards PBR Pintail Cruzer Skateboard is a great option for both longboard and beer enthusiasts. Once you upgrade the wheels and bearings, you will be sidewalk surfing in no time. The RRP for this skateboard is $179.99 but if you get in early you can buy this board from Amazon for the incredible price of $98.44. This is lower than many Santa Cruz skateboards and when you consider how good a brand they are you’ll find the price is a lot cheaper than you may expect. This entry was posted in Reviews, Santa Cruz, Skateboarding, Skateboards and tagged Longboard, Pabst Blue Ribbon, PBR, Pintail Cruzer, Santa Cruz, Skateboard. Bookmark the permalink.